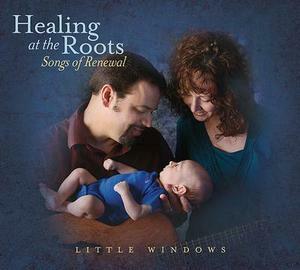 Healing at the Roots - Songs of Renewal, invites you to experience the spiritual and healing power of traditional song. Music to reflect and meditate upon, create art to, read a good book to, or take some rare quiet moments with. LITTLE WINDOWS creates a mix of Appalachian and Irish music, and traditionally-based originals, with a special focus placed on unaccompanied ballads. They also explore the spiriitual nature of song and harmonic sound. Mark Weems and Julee Glaub tour together nationally and abroad with a focus on the art of the pure voice with tight harmonies in traditional songs. Instrumentation includes guitar, fiddle, banjo, flute, piano and bodhrán. In addition to performing concerts, they also teach workshops and music camps around the country and have developed their own traditional singing camp called Camp Little Windows. Mark has been steeped in the Old Time Tradition for years while Julee has done the same in the Traditional Irish realm. Together they bring a beautiful blend of both traditions with a unique harmonic sound that is rare and often beckons the response from audience members, "I've never heard anything like it!" or that "there is a kind of lovely magic that weaves in and out of their music and settles into the audience whenever they perform." Though they have both made several recordings with other bands as well as solo projects, Julee and Mark's first recording together, Just Beyond Me, was submitted for a Grammy and has been highlighted on NPR's radio program The Thistle and Shamrock. Little Windows has a unique approach to traditional music. Both of us have discovered the deeply personal and communal value of traditional song. We believe in the spiritual and emotional wealth of the songs, and how their proper presentation can positively affect both ourselves and others who hear them. We therefore try to deliberately downplay the purely entertainment value of music and try to draw the focus away from ourselves toward the beauty and magic of the songs' haunting melodies and lyrics. We like to present our material using one microphone in order to best synchronize our vocal expression. We also like to play in the dim light of candles rather than blaring performance lights in order to provide a space where the audience can enter into the magic of these simple heartfelt songs. We believe that music in general and particularly the human voice is spiritual, almost sacramental in nature. For those unaware of the human depth of traditional song, our hope is to open up little windows into this timeless, spiritual, mythical land. a mountaintop chalet in beautiful Virginia. Click Here to view our new online video! ©2006-2007 Little Windows. All Rights Reserved. Header photo by Jim Davis.